Virginia Governor Ralph Northam recently announced a $300,000 grant to create Industry Labs at Liberty University's Center for Energy Research & Education (CERE) in Bedford County. The grant will help with the construction of four labs at CERE to offer regional companies and institutions of higher education, including Liberty's School of Engineering, the facilities necessary to promote research and development. 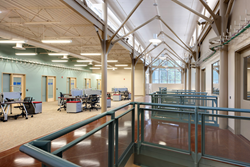 Inside Liberty University's Center for Energy Research & Education. Virginia Governor Ralph Northam recently announced a $300,000 grant to create Industry Labs at Liberty University's Center for Energy Research & Education (CERE) in Bedford County. The grant was one of five regional projects funded through GO Virginia (Growth and Opportunity for Virginia) to diversify the respective regional economies, strengthen their workforce, and support collaborative programs between localities, public entities, and private businesses. The grant will help with the construction of four labs at CERE: a chemical/material lab, an EMC (electromagnetic compatibility) lab, a calibration lab, and a non-destructive testing lab. The labs will offer regional companies and institutions of higher education, including Liberty's School of Engineering, the facilities necessary to promote research and development. They will be used by advanced manufacturing companies in the energy and technology sectors for testing, research, and workforce development training. The labs will attract and retain a strong scientific and engineering workforce in the community. "We are excited about what this project means to local and regional economic development efforts," said Jonathan Whitt, Liberty's vice president of special projects and business engagement. "The Town of Bedford, Counties of Campbell and Bedford, the City of Lynchburg, Central Virginia Community College, and the Regional Business Alliance have all supported this project along with several of the region's leading employers. These labs will offer companies and partnering institutions of higher education the facilities necessary to promote research and development as well as to foster the attraction and retention of the scientific and engineering workforce that our community needs." Liberty will provide oversight and administration to establish the labs, working with industry professionals to ensure they are responsive to current and future needs, and to acquire and configure new equipment. The university will also work with local economic development agencies to improve ready-to-market information about the CERE Industry Labs site and building characteristics to increase connection and collaboration between localities, businesses, and other colleges and universities. Liberty purchased the CERE facility (formerly the Center for Advanced Engineering and Research) and the surrounding 28-acre lot at the New London Business and Technology Center park last spring. It is located off U.S. 460 in Bedford County, about 10 miles from main campus. Businesses continue to operate at the facility, and Liberty's engineering program will be relocated there following construction improvements. Liberty has already invested $4.5 million into CERE. Local and state entities are expected to invest another $1.6 million in the next five years. The lab project is projected to net a $15 million return on investment through research grants, job creation, and training programs. Liberty University, founded in 1971, is the largest private, nonprofit university in the nation and the largest university in Virginia. Located near the Blue Ridge Mountains on more than 7,000 acres in Lynchburg, Va., Liberty offers more than 550 unique programs of study from the certificate to the doctoral level. More than 250 programs are offered online. Liberty's mission is to train Champions for Christ with the values, knowledge, and skills essential for impacting tomorrow's world.